Scientists find a theoretical optical device may have uses in quantum computing. Nearly 150 years ago, the physicist James Maxwell proposed that a circular lens that is thickest at its center, and that gradually thins out at its edges, should exhibit some fascinating optical behavior. Namely, when light is shone through such a lens, it should travel around in perfect circles, creating highly unusual, curved paths of light. He also noted that such a lens, at least broadly speaking, resembles the eye of a fish. The lens configuration he devised has since been known in physics as Maxwell’s fish-eye lens — a theoretical construct that is only slightly similar to commercially available fish-eye lenses for cameras and telescopes. Now scientists at MIT and Harvard University have for the first time studied this unique, theoretical lens from a quantum mechanical perspective, to see how individual atoms and photons may behave within the lens. In a study published Wednesday in Physical Review A, they report that the unique configuration of the fish-eye lens enables it to guide single photons through the lens, in such a way as to entangle pairs of atoms, even over relatively long distances. Entanglement is a quantum phenomenon in which the properties of one particle are linked, or correlated, with those of another particle, even over vast distances. The team’s findings suggest that fish-eye lenses may be a promising vehicle for entangling atoms and other quantum bits, which are the necessary building blocks for designing quantum computers. The team also found that the fish-eye lens, contrary to recent claims, does not produce a perfect image. Scientists have thought that Maxwell’s fish-eye may be a candidate for a “perfect lens” — a lens that can go beyond the diffraction limit, meaning that it can focus light to a point that is smaller than the light’s own wavelength. This perfect imaging, scientist predict, should produce an image with essentially unlimited resolution and extreme clarity. However, by modeling the behavior of photons through a simulated fish-eye lens, at the quantum level, Perczel and his colleagues concluded that it cannot produce a perfect image, as originally predicted. Perczel’s co-authors on the paper are Peter Komar and Mikhail Lukin from Harvard University. Maxwell was the first to realize that light is able to travel in perfect circles within the fish-eye lens because the density of the lens changes, with material being thickest at the middle and gradually thinning out toward the edges. The denser a material, the slower light moves through it. This explains the optical effect when a straw is placed in a glass half full of water. Because the water is so much denser than the air above it, light suddenly moves more slowly, bending as it travels through water and creating an image that looks as if the straw is disjointed. In the theoretical fish-eye lens, the differences in density are much more gradual and are distributed in a circular pattern, in such a way that it curves rather bends light, guiding light in perfect circles within the lens. In 2009, Ulf Leonhardt, a physicist at the Weizmann Institute of Science in Israel was studying the optical properties of Maxwell’s fish-eye lens and observed that, when photons are released through the lens from a single point source, the light travels in perfect circles through the lens and collects at a single point at the opposite end, with very little loss of light. Leonhardt, in reporting his results, made a brief mention as to whether the fish-eye lens’ single-point focus might be useful in precisely entangling pairs of atoms at opposite ends of the lens. To investigate the quantum potential of the fish-eye lens, the researchers modeled the lens as the simplest possible system, consisting of two atoms, one at either end of a two-dimensional fish-eye lens, and a single photon, aimed at the first atom. Using established equations of quantum mechanics, the team tracked the photon at any given point in time as it traveled through the lens, and calculated the state of both atoms and their energy levels through time. They found that when a single photon is shone through the lens, it is temporarily absorbed by an atom at one end of the lens. It then circles through the lens, to the second atom at the precise opposite end of the lens. This second atom momentarily absorbs the photon before sending it back through the lens, where the light collects precisely back on the first atom. Perczel says that the photon is able to entangle the atoms because of the unique geometry of the fish-eye lens. The lens’ density is distributed in such a way that it guides light in a perfectly circular pattern and can cause even a single photon to bounce back and forth between two precise points along a circular path. 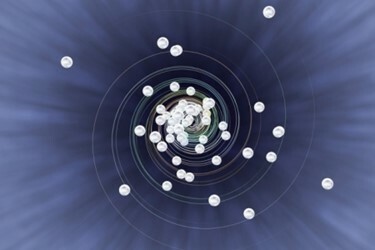 As they increased the size of the fish-eye lens in their model, the atoms remained entangled, even over relatively large distances of tens of microns. They also observed that, even if some light escaped the lens, the atoms were able to share enough of a photon’s energy to remain entangled. Finally, as they placed more pairs of atoms in the lens, opposite to one another, along with corresponding photons, these atoms also became simultaneously entangled. “You can use the fish eye to entangle multiple pairs of atoms at a time, which is what makes it useful and promising,” Perczel says. In modeling the behavior of photons and atoms in the fish-eye lens, the researchers also found that, as light collected on the opposite end of the lens, it did so within an area that was larger than the wavelength of the photon’s light, meaning that the lens likely cannot produce a perfect image. Going forward, the team hopes to work with experimentalists to test the quantum behaviors they observed in their modeling. In fact, in their paper, the team also briefly proposes a way to design a fish-eye lens for quantum entanglement experiments.